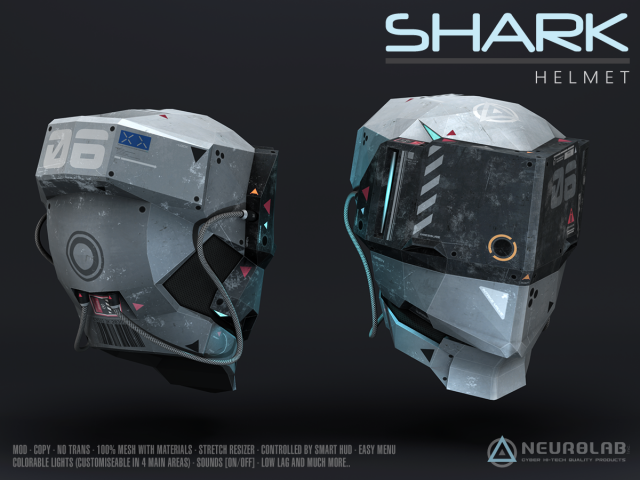 The Helmet are supplied with a HUD customization “Smart Hud,” which allows you to customize 4 different zones with an infinite number of combinations. It features 12 different visors LED style and animations settings, These are all accessible via the HUD. The helmet is fully modify for you to fit to your avatar. You can also edit the glow as separate faces and give them your own color! Resizer system with Stretch, PERFECT fit to all avatars and Kids! • 3 Choices Visor LED Speed (Slow,Speed,stop). – Click to Helmet to open “Menu setting”, then adjust your size (X,Y,Z), sound volume. – Wear the Smart HUD, Click to “HUD CUSTOM” button to the Product menu to connect product and customize..
– To customize Visor design, open Option Tab. here you can adjust speeds and textures. You can change the breath sound with your own. Rename your audio loop in “.NlaB Shark Sound” and replace the content by erasing the original sound and sliding your sound instead.